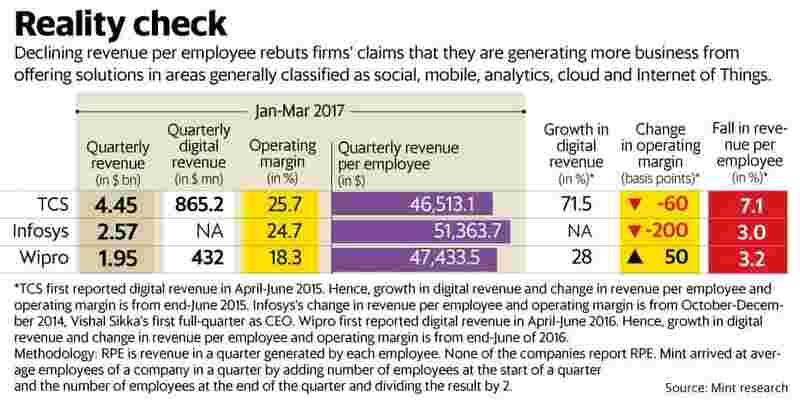 Bengaluru: Tata Consultancy Services Ltd (TCS), Infosys Ltd and Wipro Ltd are grappling with falling revenue per employee and operating margins as Indian software firms struggle to generate revenue from new businesses such as data analytics even as demand for old services weakens. Declining revenue per employee (RPE), a measure of how well a company delivers value-added work to clients, rebuts claims made by companies that they are generating more business from offering solutions in areas generally classified as social, mobile, analytics, cloud and Internet of Things. Since there is no common definition, digital for now remains a fuzzy word. “The biggest issue with digital is the lack of clarification and definition of what it is," said Phil Fersht, chief executive officer (CEO) of US-based HfS Research, an outsourcing-research firm. “For most of the Indian majors, they include the whole ‘SMAC Stack’ which is social, mobile, analytics and cloud, where many traditional IT contracts can be sugar-coated." Declining RPE and profitability are key reasons behind Indian software companies planning to cut their existing workforce as employee costs account for over half of their total operating expenses. For both TCS and Wipro, RPE has declined in the periods since these companies started to report business from digital technologies. TCS claims digital revenue accounted for 17% or $3 billion of its $17.58 billion revenue at the end of March 2017. A Mint analysis shows that despite the country’s largest IT firm reporting a 71% increase in digital revenue from the time it first reported digital revenue at the end of June quarter in 2015, overall RPE declined 7.1% by the end of March quarter. Ditto for Wipro. India’s third-largest software services company saw its RPE decline 3.2% in the last year despite the management’s claims of 28% growth in digital revenue. Infosys has until now shied away from disclosing revenue from digital technologies. However, the management has been most vocal on using artificial intelligence and automation platforms and over the past 33 months, CEO Vishal Sikka has spoken on steps taken to move away from deploying armies of engineers to manage the IT infrastructure of clients based in the US and UK. Still, Infosys’s RPE has fallen 3% since October-December 2014, Sikka’s first full-quarter as CEO. Over the past decade, faster computing power and higher internet usage across the world has made Fortune 1000 companies look at newer technologies like data analytics to run their business better. Offering solutions by using data-crunching technologies command a high price even as automation tools are fast changing the way outsourcing companies traditionally did business of either managing computers or offering customer support to clients and client-run businesses. So what explains this divergent trend of a fall in both profitability and RPE despite strong growth in digital? First, home-grown IT firms generate tiny business from offering next-generation solutions and bulk of the digital revenues are simply re-badged old traditional work. “Take for example a classic work like ERP (enterprise resource planning) upgrade to support a subscription billing model. Now that project to any IT services vendor worth their salt is being classified as digital revenue, is this really digital?" asked Ray Wang, founder of Constellation Research, a technology research and advisory firm. For this reason, a few executives believe that a better metric to evaluate health of an IT firm is to see the growth in data analytics. “We are moving in a world which is seeing a data explosion. How do you eventually make sense of large sets of data? A true test is how can I make my company better monetize this," L&T Infotech Ltd CEO Sanjay Jalona, said in an interview earlier this month. L&T Infotech, India’s sixth largest IT outsourcing company, reported a 9.3% dollar revenue growth in the year ended March 2017 to end with $970 million in revenue, thanks to a 35% increase in business from data analytics. L&T Infotech also improved its profitability from 17.2% at the end of the March quarter last year to 18.9% even as RPE jumped by 9.3% to $48,832.5. Both TCS and Infosys do not disclose revenue from data analytics. A second issue is that even a strong growth from next-generation technologies is not enough to offset the decline in demand in the traditional areas of work. “In some sense, there is an inflection point, where the pricing pressure for traditional business is still high. Some of our largest customers de-grew and so it impacted Mindtree. So despite the strong growth in digital, I cannot really tell you when this higher growth in digital will be able to offset the decline in traditional business," said Mindtree Ltd CEO Rostow Ravanan.